The sky over Lake Audy in Riding Mountain National Park in Manitoba, Canada is painted in yellow and orange hues at sunset. A canoeist finds this time of day to be one of the prettiest and quietest to enjoy the serenity of Lake Audy and the stunning sunset scenery. Bordered by boreal forests, Lake Audy is an amazing place to explore while canoeing but others prefer the outdoor activities such as fishing, boating and swimming. A campground located along the shore of Lake Audy allows visitors to take in the sunset from around their campfire. Many nature lovers come to Lake Audy during the summer months to take in the natural wonders surrounding the lake but only a canoeist can get to places unknown on the far shores. On this particular evening, this solo canoeist simply paddles around taking in the sunset hues and the soft reflections across the surface of the lake. 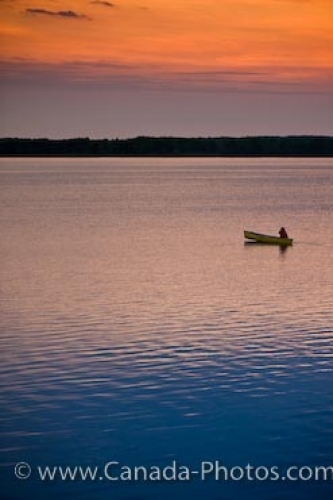 Picture of a canoeist enjoying the sunset over Lake Audy in Riding Mountain National Park, Manitoba.